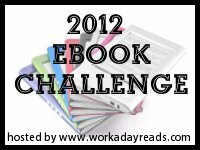 Welcome to the July round-up for the reviews for the 2012 Ebook Challenge. Before you enter your reviews in the linky tool below, ensure you have signed up. Unfortunately, June went by so fast that I didn’t get a chance to arrange a prize for July. I will try to be more organized for August. In the meantime, the challenge is now officially halfway done. How are you doing at your goal? Are you at least halfway there? For July, I read an e-book won from The Library Thing, “Growing Up Bronx”. Have just added the 2 e-books I read in June. Reached my goal: 2.CD – 10 ebooks Thanks for this challenge. This was another big reading month for me. Lots of new to me authors.